FUEL EFFICIENT 21 MPG Hwy/15 MPG City! CARFAX 1-Owner, LOW MILES - 50,148! 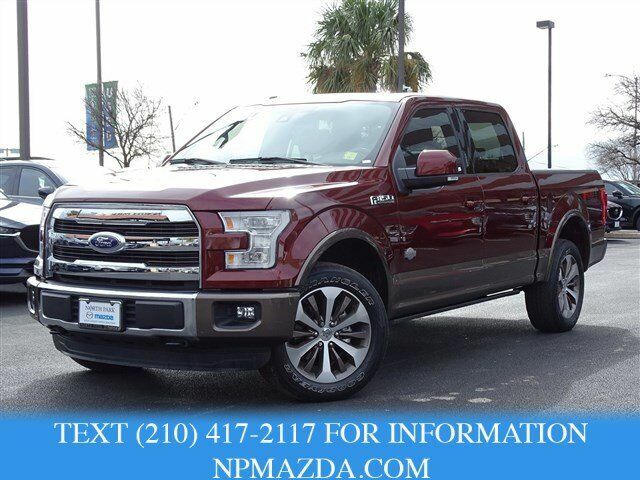 Navigation, Sunroof, Heated/Cooled Leather Seats, Back-Up Camera, Heated Rear Seat, 4x4, Trailer Hitch, ADAPTIVE CRUISE CONTROL & COLLISION W... CLICK ME! Blind Spot Monitor, Cross-Traffic Alert, Child Safety Locks, Electronic Stability Control, Adjustable Pedals, Brake Assist, 4-Wheel ABS Safety equipment includes Blind Spot Monitor Ford King Ranch with Bronze Fire Metallic exterior and MESA, KING RANCH MESA LEATHER BUCKET SEATS -inc: 4-way adjustable driver/passenger headrests, heated interior features a 8 Cylinder Engine with 385 HP at 5750 RPM*. EQUIPMENT GROUP 601A LUXURY Inflatable Rear Safety Belts, Multi-Contour Seats Driver and passenger, Blind Spot Information System (BLIS), cross-traffic alert sensor in taillamp, Tailgate Step w/Tailgate Lift Assist, Power-Deployable Running Boards, Wheels: 20" Machined-Aluminum, light Caribou painted pockets and Caribou wheel ornament w/Caribou King Ranch logo, Automatic High Beam w/Rain-Sensing Wipers Windshield wipers, Tires: P275/55R20 OWL Automatic Transmission (4), 275/65R 18 OWL all-terrain spare tire, TWIN PANEL MOONROOF, ADAPTIVE CRUISE CONTROL & COLLISION WARNING brake support, ENGINE: 5.0L V8 FFV (STD). Edmunds.com explains "Everything in the interior is ergonomically designed in such a way that there's a padded armrest exactly where you'd want it, and frequently used controls are located right where your hand would instinctively reach for it.". Great Gas Mileage: 21 MPG Hwy.